Last year I read Genevieve Graham’s Tides of Honour, a love story set in Halifax during the time of WWI and the Halifax Explosion. 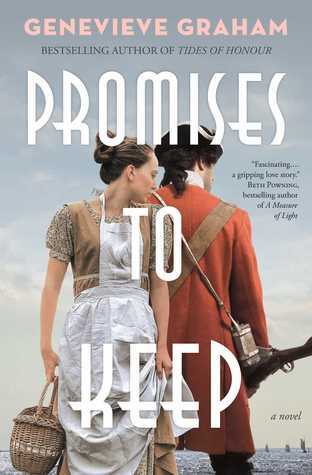 Her new book, Promises to Keep is a love story set in 1755 l’Acadie (in the Grand Pré area of Nova Scotia), during the time of the deportation of the Acadians by the English. Promises to Keep tells the story of Amélie and her family as their lives are disrupted and their livelihood taken away; the only one they’ve known for many generations. The English are at war with the French, and although the Acadians remain neutral, they also refuse to swear allegiance to the King of England. The English consider them a threat, so have decided to remove them from their home. Besides, the Acadians have the best farmland around, on account of their ingenious dyke system, highly coveted by the English. In the midst of it all, Amélie gets to know one of the English soldiers. Connor is obligated to follow orders, but he doesn’t like them (being a Scot who has also recently had his home taken away by the British). He tries to help Amélie and her family as much as he can without giving himself away (the punishment for treason being death). What follows is the separate journeys Amélie and Connor find themselves on, away from everything they know, and towards what their futures have in store for them. You must not underestimate the British Army. This book is a love story, but the romance between the couple is very much in the background, used as a platform on which to tell a bigger story. The author does a wonderful job conveying the history of the time; the conflict between the Acadians and the English soldiers, the distress of the upheaval, the Acadians’ alliance with the Mi’kmaq, and their connections to each other and to the land they come from. Though I could not hear the fire, the noise of breaking hearts was deafening. There is not a lot of fiction out there about the Acadian Expulsion, which is one of the reasons I enjoyed this book so much, reading through it in just two days. My children go to one of the Acadian Schools in the province, and although we’re not of Acadian descent ourselves, we are proud of the Acadian culture here in Nova Scotia and want to be a part of its preservation. The deportation of the Acadians is an unhappy but significant part of Nova Scotia’s history, and I’m grateful to Genevieve Graham for highlighting it in one of her books. I look forward to seeing what historical event she will choose to write about next! 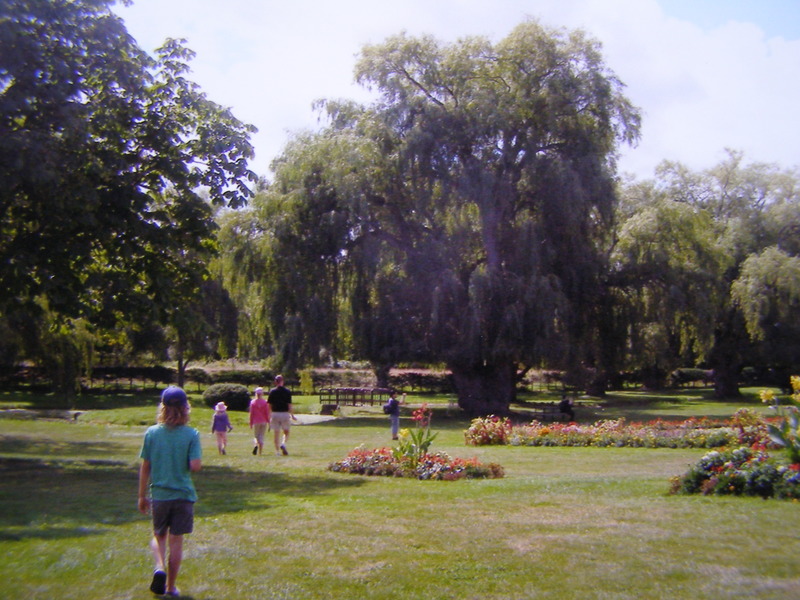 The willow trees of Grand Pre. An excellent book for both children and adults (I read it a few years ago) is Banished From Our Home: The Acadian Diary of Angélique Richard by Sharon Stewart, one of the many books in the Dear Canada series. Interesting subject matter! The only thing I’ve ever read on this subject is the poem “Evangeline,” which we had to read in 8th grade, or maybe 9th. 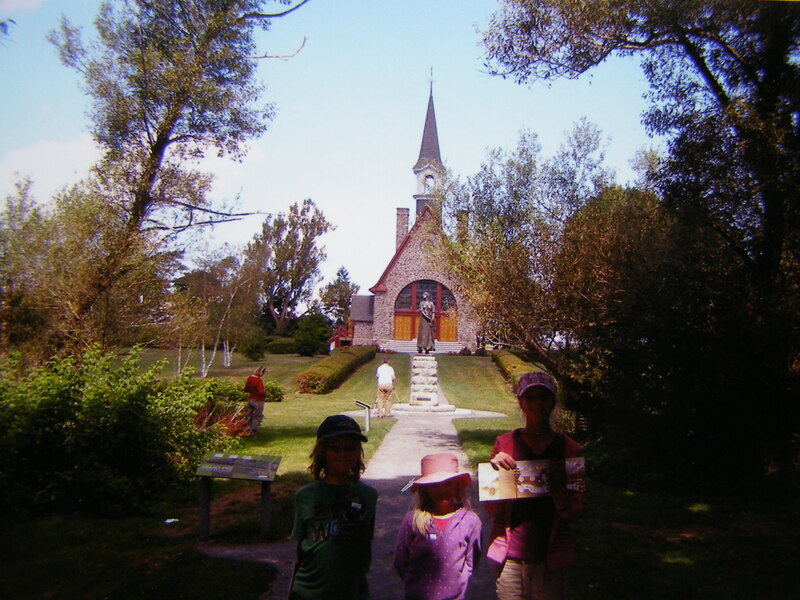 The statue of Longfellow’s Evangeline stands in front of the Memorial Church at Grand Pre. I’ve also only read about this in Evangeline, but that’s sad enough, I’m not sure I want to read any more. This sounds really good though and I love the cover! The event is sad, but the characters don’t wallow in pity – they’re strong and inspiring. You should try it! I found her first book a little heavy on the romance for my taste, but even then I did appreciate the backdrop of history that she created for readers, and it sounds like this might be even more prominent in this story. Glad to read your thoughts on it and glad these subplots are getting some ink! I felt the same way about Tides of Honour (although I still appreciated many parts of it). I liked this one more, because the romance was more in the background, and I think also because it wasn’t as long – I think I remember feeling like Tides of Honour could have been shorter. Her style of writing isn’t usually my taste, but I’ve definitely been interested in the subjects she’s written about in her last two books! I love it when I find a novel about a piece of history or a culture I somehow missed. I don’t remember if he named them, but that’s probably right. It would have been around 1745. Probably, then, though it’s a little earlier than I think of the Clearances as such. But only by a few years, and these things are always hard to be too specific about. Thanks for link at the top from the Canadian Encyclopedia — I’m learning my Canadian history little by little and who the Acadians are. This novel sounds like a good one about the Expulsion. It seemed a fast read for you!